Advanced therapy medicinal products (ATMPs) are medicines for human use that are based on genes, tissues or cells. They offer groundbreaking new opportunities for the treatment of disease and injury. In addition, some ATMPs may contain one or more medical devices as an integral part of the medicine, which are referred to as combined ATMPs. An example of this is cells embedded in a biodegradable matrix or scaffold. For detailed definitions of the different groups of advanced therapy medicinal products, refer to Regulation (EC) No 1394/2007 and Directive 2001/83/EC. All advanced therapy medicines are authorised centrally via the European Medicines Agency (EMA). They benefit from a single evaluation and authorisation procedure. As with all medicines, the Agency continues to monitor the safety and efficacy of advanced therapy medicines after they are approved and marketed. The Agency also gives scientific support to developers to help them design pharmacovigilance and risk management systems used to monitor the safety of these medicines. It contains several actions for the European Commission and EMA. a draft revised guideline on safety and efficacy follow up and risk management of ATMPs. For more information, see Pharmacovigilance for advanced therapies. The action plan takes into account the ideas collected at an EMA-hosted multi-stakeholder workshop to explore solutions to challenges in the development of ATMPs. The Agency's Committee for Advanced Therapies (CAT) plays a central role in the scientific assessment of advanced therapy medicines. It provides the expertise that is needed to evaluate advanced therapy medicines. During the assessment procedure, the CAT prepares a draft opinion on the quality, safety and efficacy of the advanced therapy medicine. It sends this to the Committee for Medicinal Products for Human Use (CHMP). Based on the CAT opinion, the CHMP adopts an opinion recommending or not the authorisation of the medicine by the European Commission. The European Commission makes its final decision on the basis of the CHMP opinion. provides, at the request of the European Commission, scientific expertise and advice for any initiatives related to the development of innovative medicines and therapies. Stem cells are naturally occurring cells in the body that have the ability to divide and produce a range of different cell types. Stem cells are important in the growth and development of the body, as well as in repair after injury. The past few years have seen a dramatic increase in the level of knowledge about stem cells, and research and investment into their uses in medicines. Stems cells are categorised as ATMPs when these cells undergo substantial manipulation or are used for a different essential function. They can be somatic-cell therapy products or tissue-engineered products, depending on how the medicine works in the body. 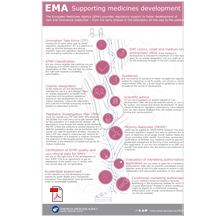 EMA follows research into the use of stem cells in medicines very closely and is responsible for assessing marketing authorisation applications for medicines containing stem cells. the Committee for Orphan Medicinal Products (COMP) has granted orphan designation to a number of medicines containing stem cells for the treatment of rare diseases. in December 2014, EMA recommended the first ATMP containing stem cells for approval in the European Union. In February 2011, the Agency published a reflection paper on stem cell-based medicinal products . The paper stressed the fact that developers of stem-cell based medicines need to pay close attention to the way the medicines are manufactured, to ensure that the final medicine is as consistent and reproducible as possible. Pre-clinical and clinical testing also needs to take account of the cells' properties, ensuring that the possible risks of tumour development and rejection by the body are studied adequately and balanced against their benefits for patients. The reflection paper was adopted by the CAT on 14 January 2011. This followed a public consultation between March and June 2010 and discussion at a public workshop in May 2010 involving 230 participants from academia, industry and regulatory authorities. For more information, see the draft reflection paper and the overview of comments received .